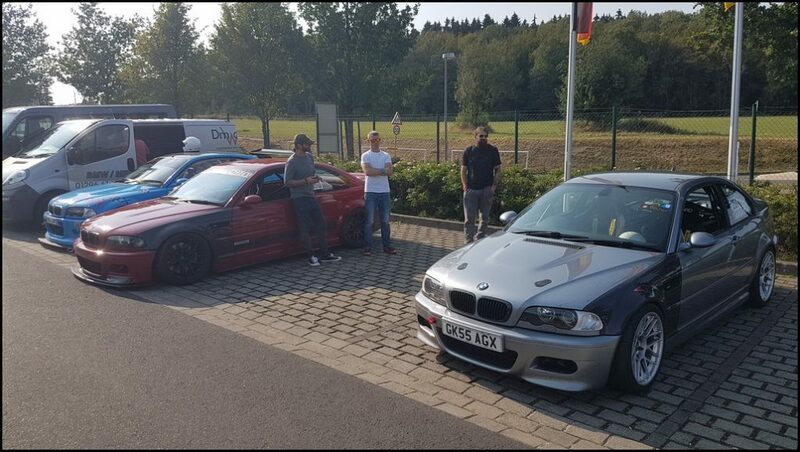 I’ve been driving on the Nürburgring since 2005. I started like most people by having a few laps in my daily driver. 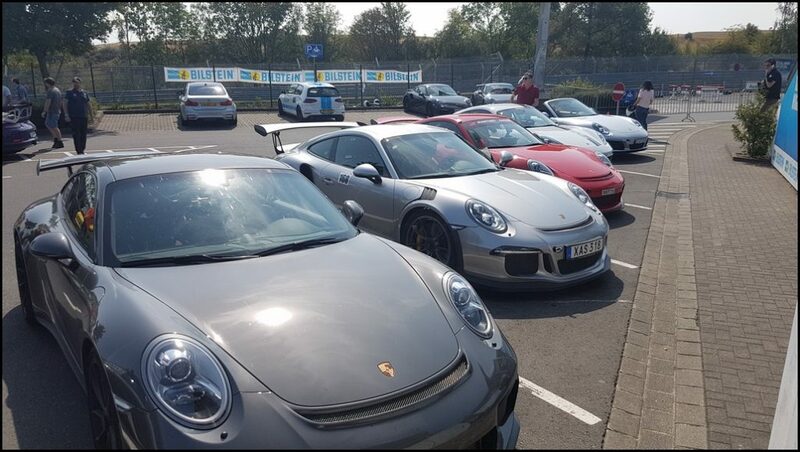 In my case, it was at the end of a 2 week European driving tour which culminated in a visit to the Nürburgring where I completed 4 laps of the Ring. I still remember the excitement of going through the barrier for that first time, seeing the red and white curbing and realising I was actually driving on a race track! I returned the year after where I managed 6 laps in the weekend and came away hooked. 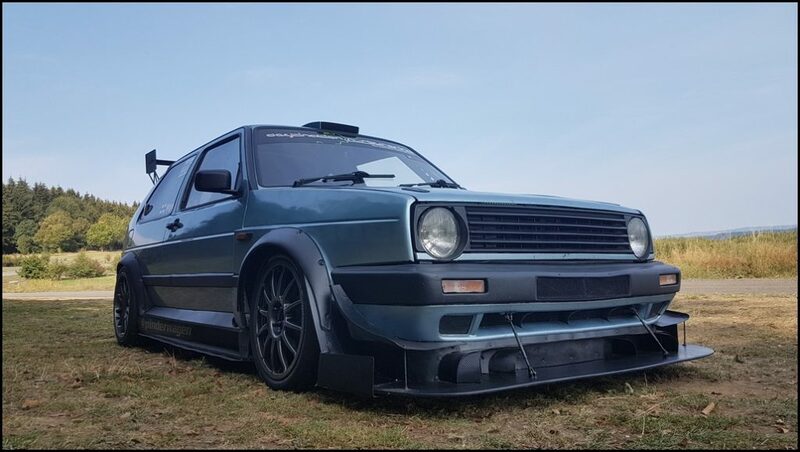 I bought my first track car that winter which was a MK2 Golf and it had been lightly modified. The next visit was Easter 2007 where I managed 35 laps before crashing and writing off the Golf. Apparently, I wasn’t quite the driver I thought I was. 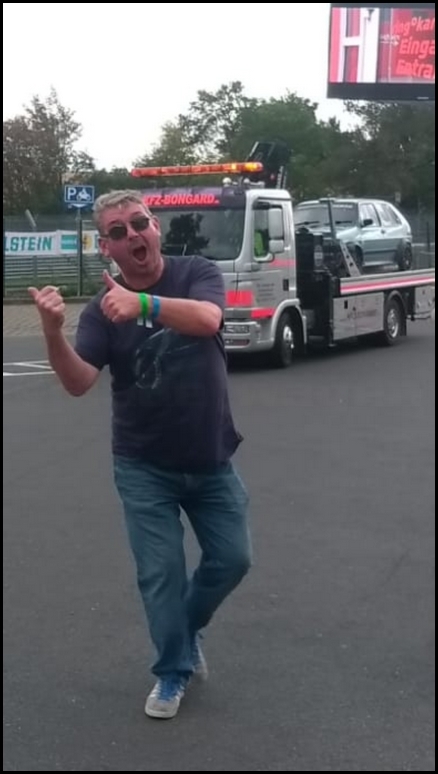 I reshelled the crashed car and over the next 7 years, clocked up over 1,800 laps during Touristenfahrten. 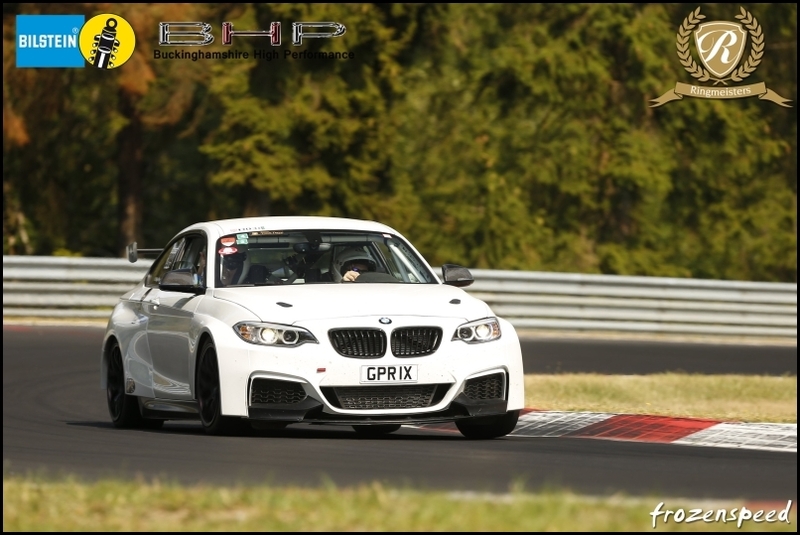 The UK insurance situation was concerning me and I did my first track day at the Ring in 2013. I then realised that the quality of track time was actually more important than the quantity. 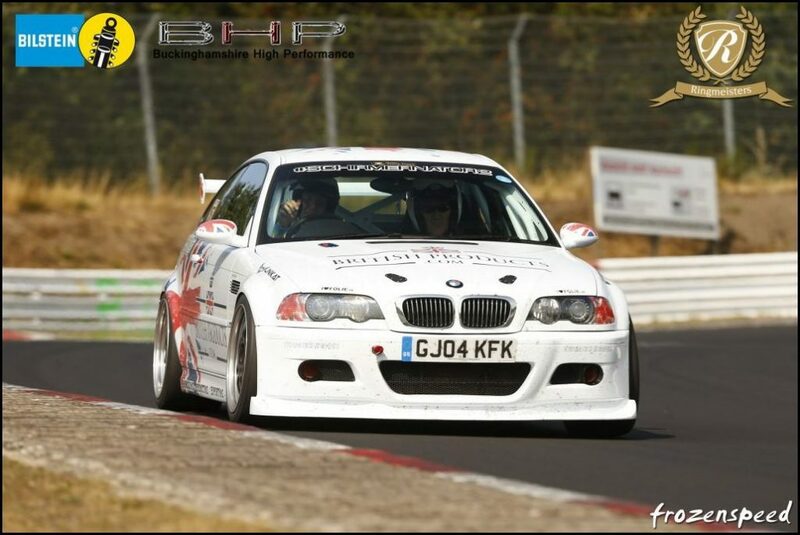 Most of the track days I have done have been with Darren on the Destination Nurburgring events. I know Darren well and my family and I help out whenever we attend. 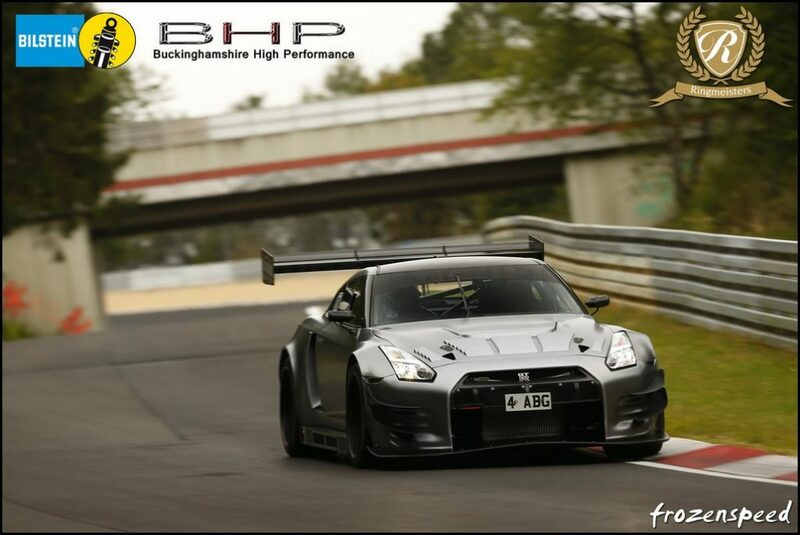 A few years ago after repeated requests from some customers, Darren introduced the Ringmeister Prime track day. These are low number events but with a higher entry price. 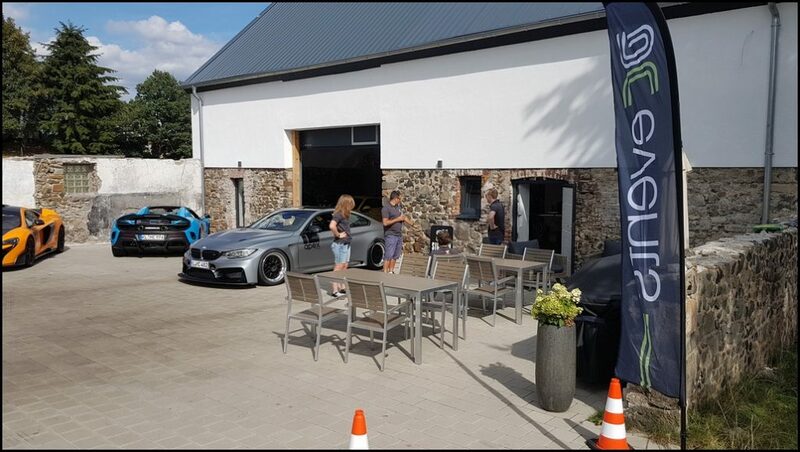 Last year I experienced my 1st Ringmeisters event, somewhat surprisingly it was even quieter than the already quiet Destination Nurburgring trackdays. 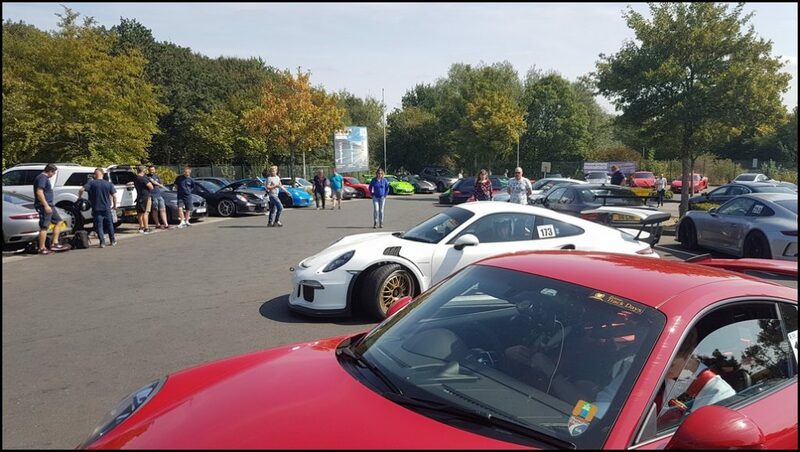 I spoke to quite a few people at the end of 2017 and the question that kept cropping up was how can a track day be worth £1,000 a day. To some people, it can’t and never will be. Yet to others that’s a price they are willing to pay without blinking. I fall closer to the first group and still had a long internal discussion with myself before booking this event. Touristenfahrten is all some drivers ever want even if they had the budget for a trackday, they don’t worry about the insurance situation and simply love the huge variety of vehicles that you never find together at the same time at any other track in the world. 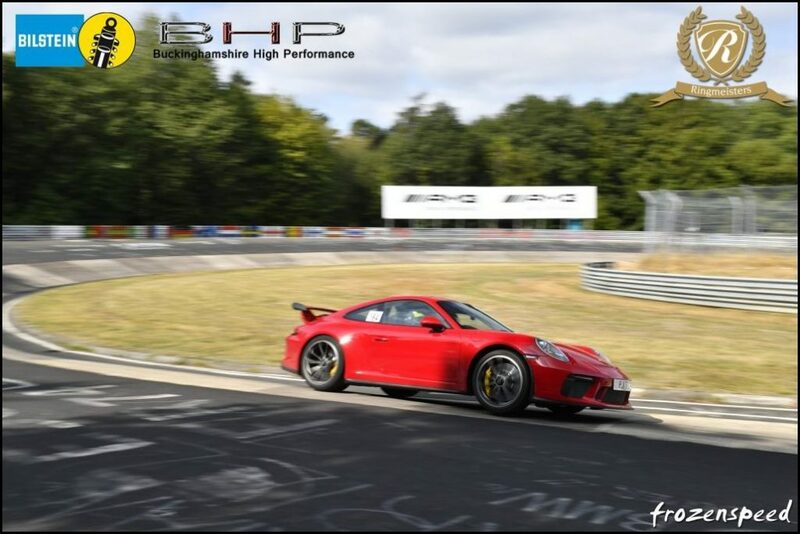 Others who have done a trackday prefer the opportunity for unlimited lapping during the event with less vehicles on circuit at any one time compared to Touristenfahrten. I finished work on Saturday evening, drove home and, as the car was already packed, set off to Hull in under 5 minutes. 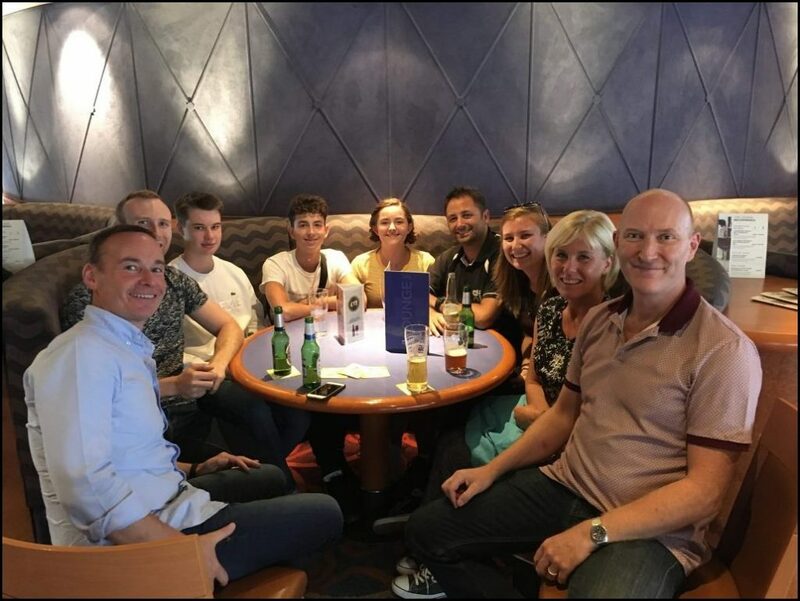 Once checked in we all met up with Darren, Paul and the kids for a drink in the Sky Lounge. The as expected the question of, “How long before the Golf breaks down?”, was asked within the first 30 seconds. It is becoming a standing joke and I was at pains to point out the car had been pretty damn reliable recently and I was full on confidence about the upcoming 2 days . Darren just laughed . We all knew the next few days were going to be busy and I think we were in bed by 22:30. The next morning after breakfast we disembarked the ferry and sat in the queue for passport control. It was by far the longest I have ever had to wait to get through, having unforeseen delays this early in the day really screwed up our plans for the day ahead, knowing that we wouldn’t be arriving in Nurburg until late afternoon. After an hour of queuing, we were then on our way across Europe. I find the towing experience in the new X5 far more relaxing than the old one. It always did its job reliably and comfortably but the newer versions are a step up. One of the options is adaptive cruise control, I find it particularly useful for the drives across the continent, despite always thinking it was a bit of a gimmick. 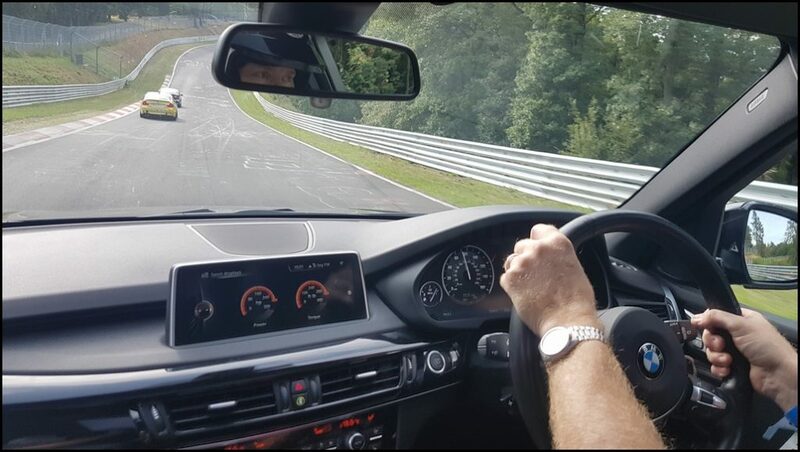 Being able to drive for over 2 hours without having to touch any of the pedals, due to the car matching the flow of traffic, made it the most stress free drive to the Nürburgring I have ever had. 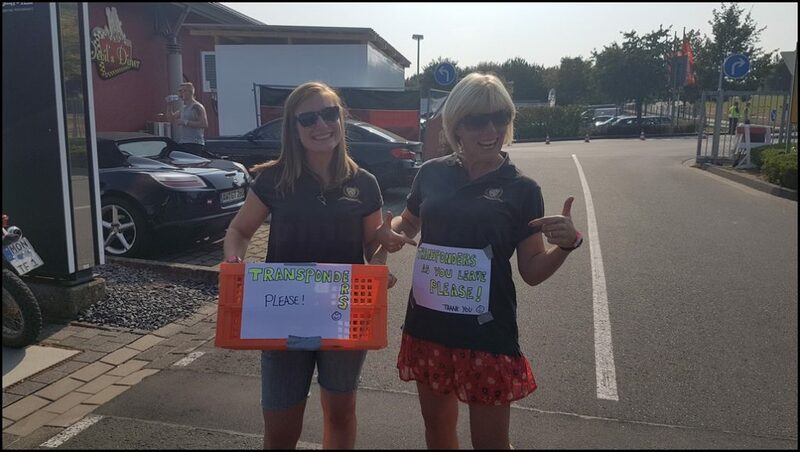 After arriving at Nurburg we checked in, unhitched the trailer, dropped our bags off and went straight to help with the signing on. For this event the sign on took place in the Apex barn in Nurburg village. 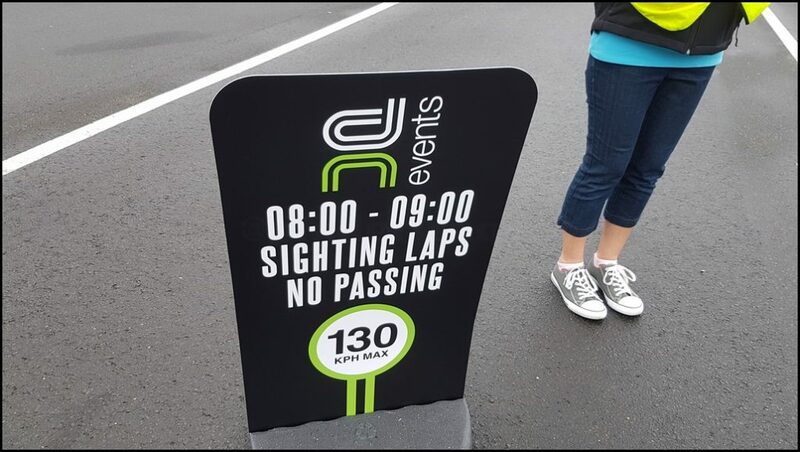 The sign on process was in the same format as last years Ringmeister event where every driver was given a personal briefing by a member of the signing on team where they were able to ask questions they may not have felt comfortable doing during a larger mass briefing scenario. There was hardly any queuing as there were 5 of us doing the signing on and briefing and as refreshments were included, people just had a coffee whilst waiting a few minutes for someone to become available to deal with them. 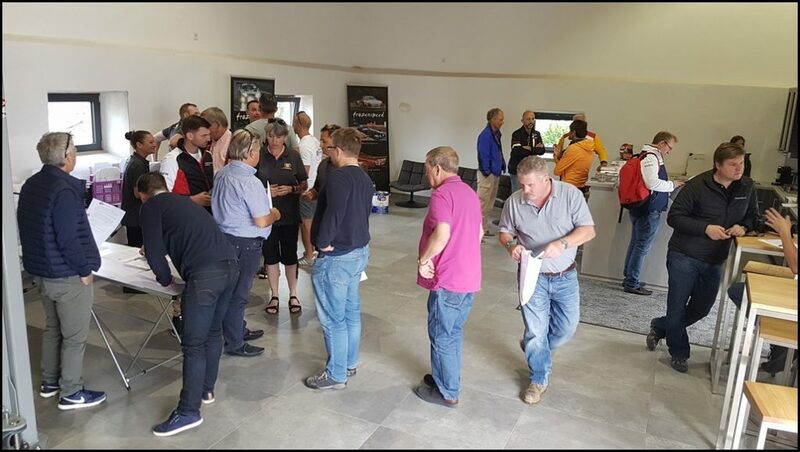 Drivers universally approve of this signing on and briefing process compared to the usual mass briefing and whilst it means more work for the signing on team it sets the tone of the whole event. 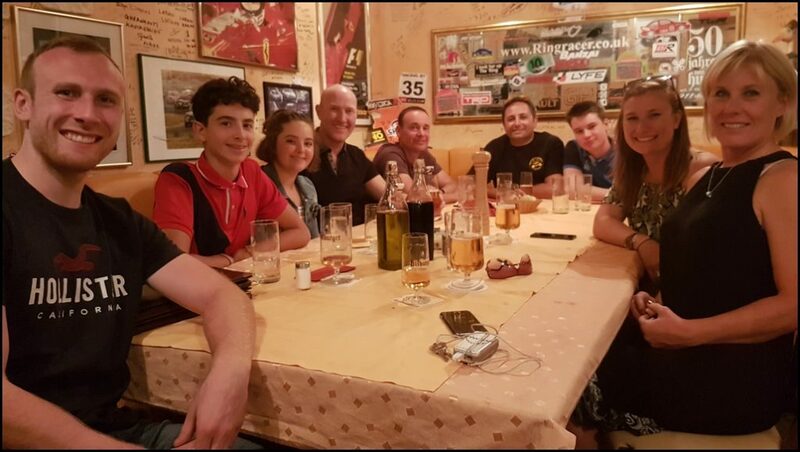 It has become traditional to have a meal at the Comfy Corner the evening before a track day. 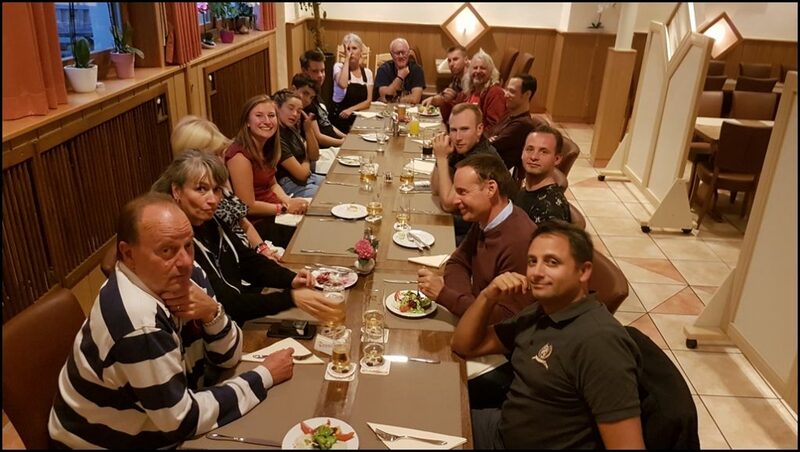 There was only a small group of 17 this time, but that didn’t stop us enjoying the evening and catching up with friends we hadn’t seen in a while. Monday morning had overcast skies and slightly damp road surfaces, this wasn’t what I had expected for late August. 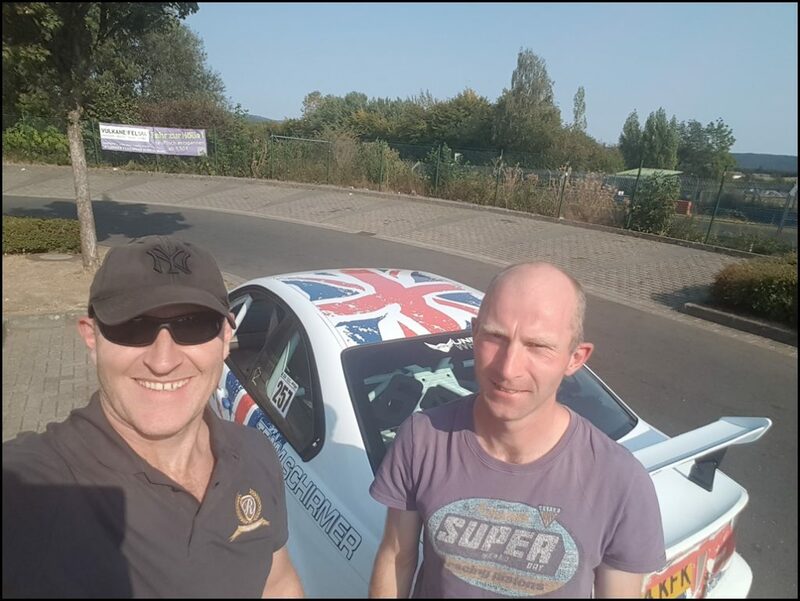 During the briefing Paul had introduced me to Rob, he had flown across from the USA on his first ever visit to the Nürburgring and had booked a rental car for the next 2 day. 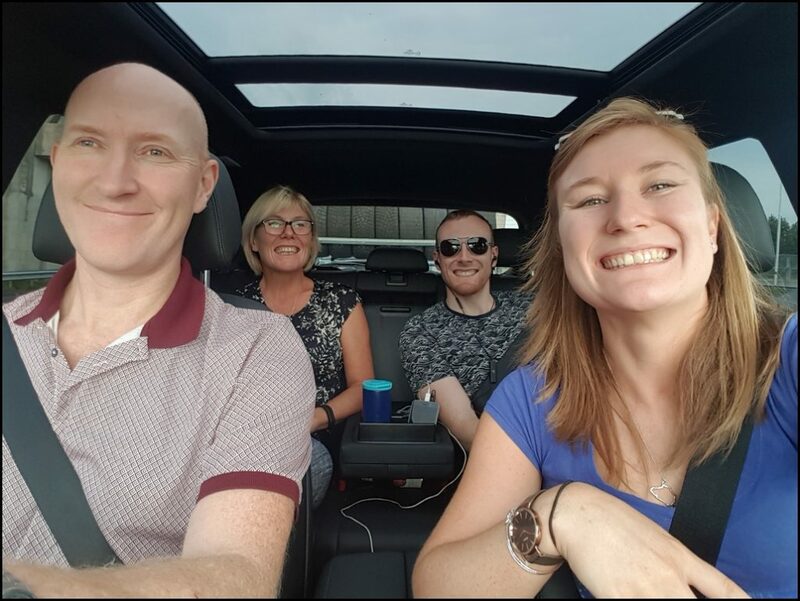 As with most rental cars they are hired for a set number of kilometers per day, it didn’t really make sense for Rob to do the sighting laps in his car. I offered to take him round in the Golf. 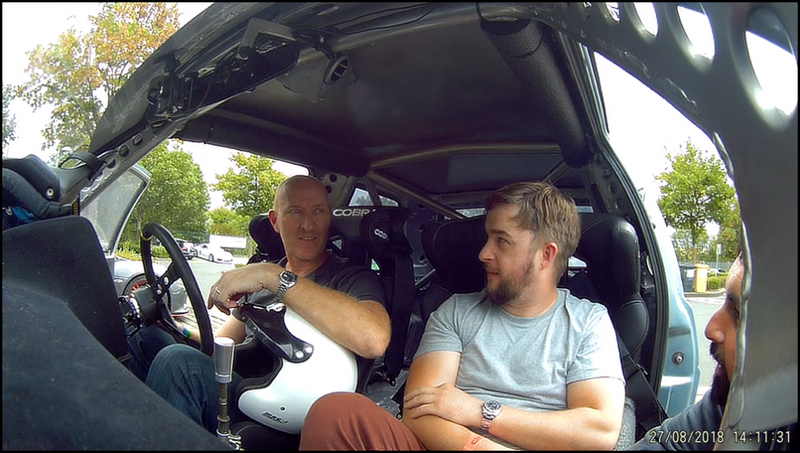 I was able to point out the main danger points and allow Rob to concentrate on what I was saying, rather than having to drive an unfamiliar car at the same time as his first laps of the ring. The benefit of having this discussion during the sighting laps is they are at a reduced pace. I could share my knowledge whilst everything was slowed down so he could take it in easier and I didn’t have to worry about other cars on a quicker lap. After the first lap we came back into the car park where we discussed the lap, the main danger points once again and then headed back out again. I pointed out where to pull off if necessary, the circuit marker boards and that for pretty much every corner, a late turn in was better than an early one. I demonstrated this by turning into the mini carousel at the same speed as the previous lap but much earlier and as expected it spat us out half way round. Rob could really see what I was trying to explain and a simple demonstration conveyed my message immediately. After the lap Rob asked if I thought instruction was advisable, whilst explaining that I regularly have instruction myself, Andy Carlisle wandered across. 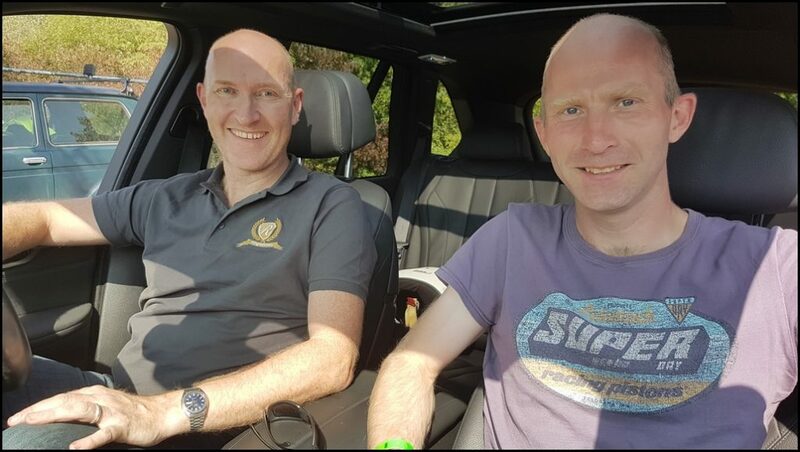 After introducing Rob to Andy, they had a chat which resulted in them spending a day and a half in Rob’s race car with Andy giving one on one instruction. Roy was on the barrier with Lou, Cat & Matt. It was still rather chilly and damp, as you can see by the fact that the tarmac hasn’t dried. Open pitlane started at 09:00 and Cat came out for the first 2 laps at speed. One of the main differences between a normal Destination Nurburgring event verses a Ringmeisters Prime one is that you can overtake on either side. The circuit was dry until you reached Hohe Acht where it became wet and slippery. It’s a testament to the sensible approach taken by everyone that nobody had an incident in those treacherous conditions. I had fitted a new 6 speed gearbox prior to this event it has smaller drops of engine revs between gears and was proving to be much better than I’d expected. The car just kept pulling where before it would feel a little laboured after a gear change, we’re not talking night and day difference but it was certainly noticeable. The next 2 laps were with Matt, after getting a decent exit from Flugplatz, I saw a new top speed of 159.8mph approaching Schwedenkreuz We came back into the carpark and dropped the tyre pressures and headed back out for another 2 laps. I found that with the 6 Speed having a shorter final drive ratio it meant that I occasionally selected the wrong gear for a corner, but we both agreed that running on 15’s was exaggerating the problem. The track had dried fully by this point so we fitted 17″ wheels. I have fitted some larger arches to house the 17’s, and with them fitted, I think the car looks pretty good. I still need to redo the deflectors in-front of the front wheels but unfortunately I didn’t have enough time before this trip to remake them, so I had to make do with a quick temporary piece. After the over sensitive handling on my last Nürburgring visit, I was delighted to find my geometry adjustments and only running the 8J wheels on the front made a huge difference to the drivability of the car. The nervousness had been removed and in its place was grip and predictability of the tyres which gave confidence . The ratios I’d chosen for the gearbox were spot on almost everywhere. I could possibly do with a slightly taller 3rd as the gap from 3rd to 4th is a fraction more than I’d like but there is only 1 gearbox that runs the 3rd gear I need so finding it was always going to be tricky. 4th, 5th and 6th were absolutely perfect and I am delighted with them. During the first day I was explaining to Matt that we would have to adjust the gear selector before the second day as I was struggling to get certain gears if I tried rushing it, this was due to the self center on the gearlever not quite lining up with the same place on the gearbox. It is an easy fix and we agreed I’d adjust it if there was a stoppage or at the end of the day. 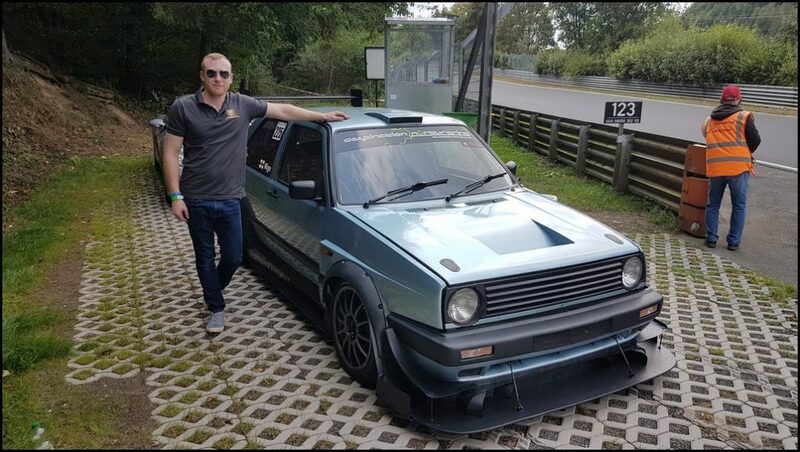 Jochen from Frozenspeed always takes photos on the Destination Nurburgring events, I was chatting to him during the signing on and asked if he was going to be at the jump at Pflanzgarten as I quite fancied a new ‘jump’ picture with the new 17″ wheels and arches. He explained that he would be there at some point and he would try. He shared a story of a discussion he’d had with a driver on a previous trackday. After taking a photo of the driver going over the jump Jochen whatsapped the image to the driver showing he had all 4 wheels off the ground. The next lap I tried again. A key point on the track I have been working on is Flugplatz. I was focusing on the entry and minimum corner speed as for the last 2 years Andy has repeatedly told me, the Golf will go quicker than my mental limit without complaint. Once the tyres were warm, I went over the crest, lifted, turned and got straight back on the power. Sure enough it went round without any issue whatsoever. The higher apex and exit speed meant I was able to tick off a long standing personal goal. 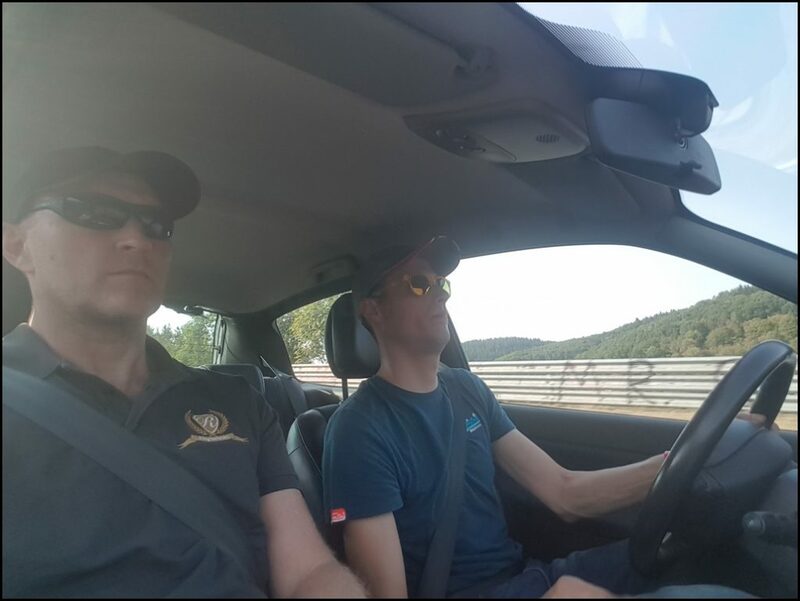 I hit 162.1mph approaching Schwedenkreuz. .
I’ve my eye on this personal goal since I turbocharged the Golf back in 2014 and exceeding 150mph on my first couple of laps with the turbo. 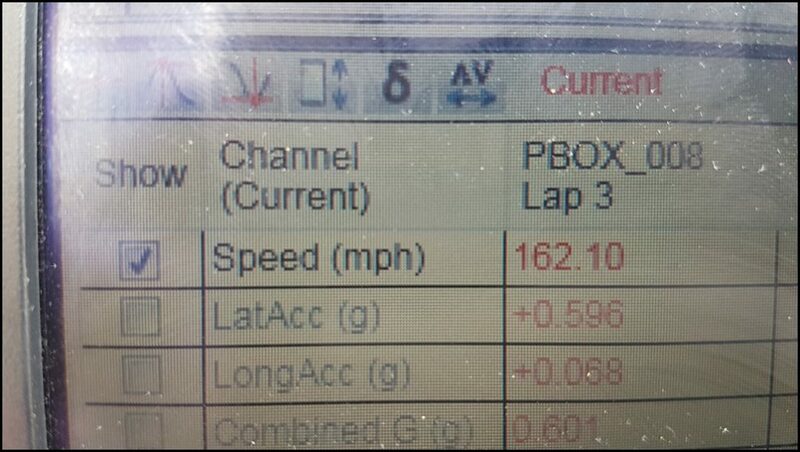 At these sorts of speed every extra MPH is hard fought for and I just couldn’t seem to crack the 160 mph / 260 km/h barrier. I could have easily removed the rear wing and gained a few miles an hour but I wanted to achieve the speed with no artificial means such as removing aero just for one lap. It’s weird, people ask if it feels that fast and to be honest, no it doesn’t. I am so busy focusing on the line, mirrors and thinking about what I’m doing when I reach the next corner I don’t really notice the actual speed at the time. After the session Matt said “I really hope the Golf stays like this for the rest of this event, it is the best it’s ever been” I had to agree with him. The aero, engine, gearbox and 17’s were all complementing each other and the car felt incredible. Everything was working well apart from needing a bit more steering angle than usual for some corners which I couldn’t really understand. Cat came out with me for a lap, although unknown to me the camera issues hadn’t been resolved. Not only was it pointing too low but it was STILL vibrating too much. It actually ended up being a decent lap and whilst it wasn’t the quickest it was an enjoyable one. I`d heard a clunking from the front when either changing direction or when the car was under load. Even after jacking it up and having a good look around I couldn’t see anything obviously loose. All the subframe and suspension bolts were tight and lined up with the paint pen marks. The steering felt the same as usual but needed more lock than usual which was strange as I’ secured the rack after it moved way back on DN14. I assumed the wishbone bushes had some play and planned to replace them when I returned home. 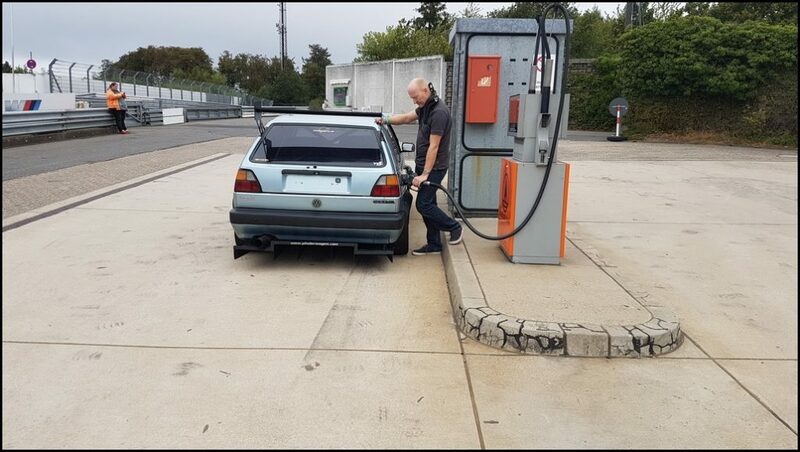 During the season the Ring management had suddenly decided to clamp down the ban on refuelling in the carpark, so instead they opened the T13 pits where you could pull off, fill up at the self-service machine and continue your lap. That’s right. 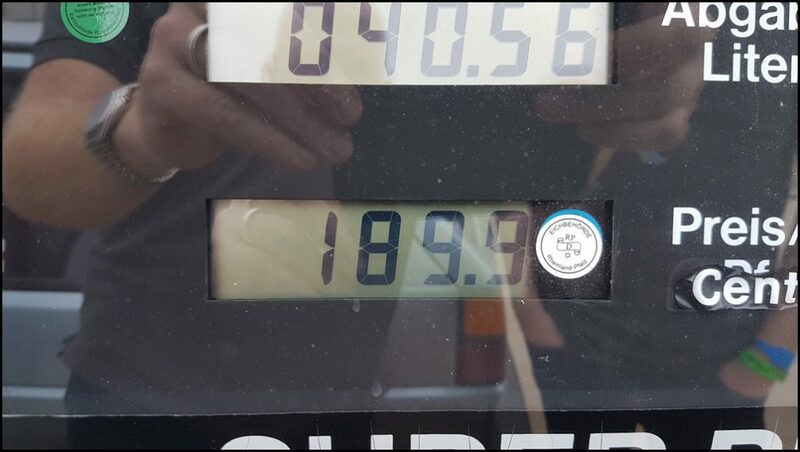 189.9 per litre. Latham had come across with Ryan and Ben from Scenemedia and asked if he could jump in for a lap. It wasn’t a bad one either and afterwards he was full of praise for the way the Golf handled. In particular the stability through the high speed sections and the way it didn’t have the usual FWD understeer handling. Obviously I explained that was the result of several years work but it is always nice to hear someone independent be so enthusiastic about the setup and handling of the car. 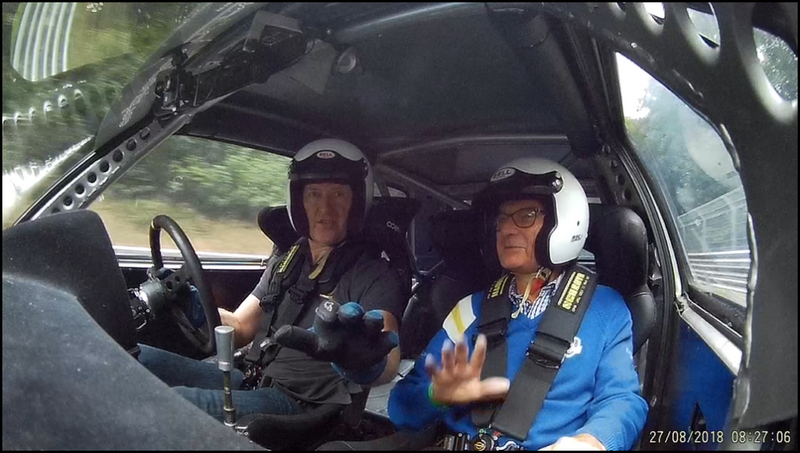 He was particularly complimentary about the way I could get on the power so early in a corner and how you could feel the diff scrabbling for grip through the front tyres, and yet the car is fairly softly sprung and isn`t tail happy like some FWD cars are setup. If you read my report from April may remember Martijn. The super helpful Dutchman who assisted me when I had a rear wheel bearing failure and was driving around looking for a replacement. I took him out back then but the car wasn’t quite right and as he had popped across to this event for some passenger laps I took him for a lap. It would be a huge understatement to say he merely ‘liked it’. I struggle to recall anyone who has been so enthusiastic from the passenger seat. Thumbs up after every section, clapping and laughing for almost the entire lap. I look downright miserable in comparison. By now it was getting late in the afternoon and Misha was free. We had spoken about doing another video of him featuring the Golf after the last one in 2016. We decided that after the lap he would ask me about the Golf in a bit more detail. As the car was running so well I suggested we get the lap out of the way rather than waiting until tomorrow as we had said earlier. We left the pits with Paul following in his E46 M3. I always enjoy watching a chase video of the Golf and every time I do I’m surprised just how much the car moves around ! I can obviously feel it from in the car but it never feels as bad as it appears from the outside. Paul’s E46 is a well tuned car and we were pretty much neck and neck on the straights although he certainly had better traction out of a few corners. Over the lap there wasn’t a lot in them and that showed when I followed him although we both agreed I was quicker from Hohe Acht until the end. That`s not really surprising, I’ve done a couple of thousand more laps than him! The track was in really good condition, with very few cars which is exactly what you expect on these days. 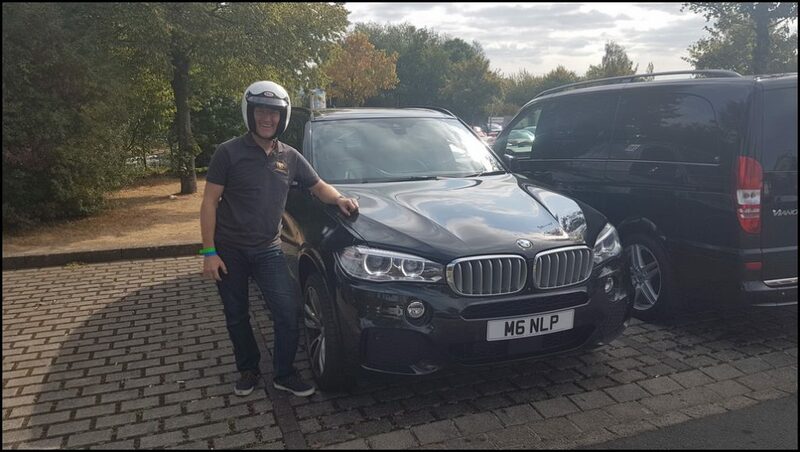 Although you`ll probably notice I am in the wrong gear in a few places, usually 4th when I should be in 3rd as I’m still getting used to what gear is the best for certain corners with the 6-speed gearbox and 17″ wheels & tyres. At the end of the lap I asked Misha if he wanted to go again and when he responded in the affirmative, I let Paul past on the straight and followed him for the second lap. I’m very comfortable following someone and certainly find it much easier than being followed. Whilst I don’t get make a large number of mistakes I am always aware when someone is sat behind me even when I know they aren’t going to pass. Going over the crest on the approach Pflanzgarten I had a weird juddering through the steering wheel, it is at 15:00 on the video below, it’s something that has never happened before and is related to the steering wheel needing more lock which I’ve mentioned earlier and will explain later in this report. As we went over the Pflanzgarten jump and landed I went to dab the brakes but the pedal almost went to the floor ! I wasn’t quite sure what was the problem and the last thing I wanted to do was run into the back of Paul so I dropped it a gear but for some reason that I still can’t understand I ended up selecting 3rd rather than of 4th. The gears are in the same place they have always been and I have absolutely no idea what caused me to go for 3rd instead of 4th..
Just listen to the poor engine at 15:05 when I cause a huge over-rev, my limiter is 7,200rpm and I hit 8,450rpm. Yeah, that’s never a good thing is it… At the time I thought nothing of it and the car felt fine for the rest of the lap. I was about to find out that wasn’t the case and I had caused a huge amount of damage with that one bad ‘moneyshift’ . At the end of the second lap, Misha and I had a chat. I talked about the Golf for almost 8 minutes, hopefully explaining my thought process and development of the Golf over the last 11 years. It’s much easier if you watch yourself and if you skip to 16:20 you’ll miss the 2 laps and go straight to our chat. I asked Matt if he wanted a drive. “Nope, I’ll wait until tomorrow I don’t want to break it !” That may seem a somewhat negative reply but Matt has had some bad luck when driving before with failures that would have happened regardless of who was driving. That’s easy for me to say but after it happening more than once he was always apprehensive about getting behind the wheel. I explained the car felt fantastic and I’d done 19 laps already with zero issues, the steering was a bit weird but if you just added more lock it was OK, I’d had a strange vibration before Pflanzgarten and then gone from 5th to 3rd, but yeah, it was fine ! With that ringing endorsement of how well the car was performing he was even more reluctant to have a drive. He agreed that made sense and went out for a steady lap. By now I was starting to wonder if asking him for feedback was such a good idea. Finally, some positive feedback ! We were only at Adenauer Forst…..
Before you start thinking he’s just moaning for the sake of it, that isn’t the case at all. I specifically asked him for feedback about what he did and didn’t like. It is no good him getting out and saying everything was wonderful when it wasn’t. 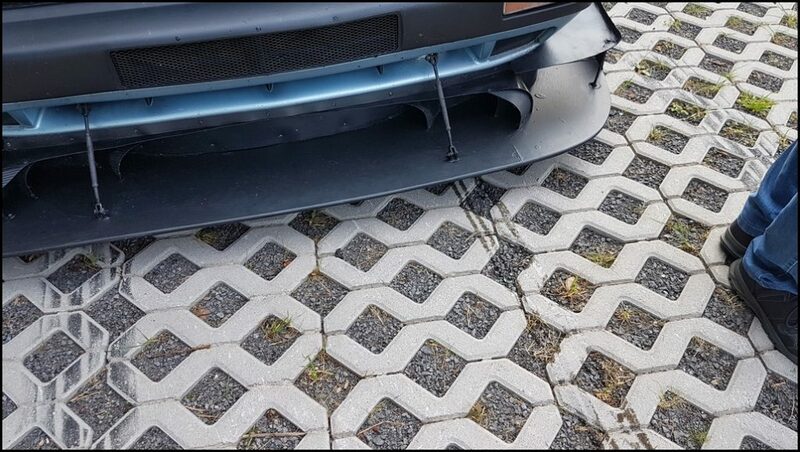 A second viewpoint from someone who has a great feel for what the car is doing underneath them is always welcomed and I actually agreed with all his points. None of them are major and wouldn’t stop us driving but they are all little things that can be adjusted to make the car even better. Going round Miss-Hit-Miss in 4th at 6,700rpm we both heard a noise from the engine that was unusual. I pulled a face and Matt immediately looked in the mirror to check we weren’t dropping and fluids. Exiting Weirseifen was fine but then he couldn’t change gear going over the Breidscheid bridge, we coasted up Ex-Muhle and both thought the clutch had failed. That’s no problem, I’d taken a spare with me. We stopped at the marshall post and the marshall pushed the car backwards behind the barrier. That’s when I saw the oil on the floor, one smell and I instantly knew it was the gearbox, nothing else in a car smells quite so unpleasant. Looking on the circuit there was NO oil on track. 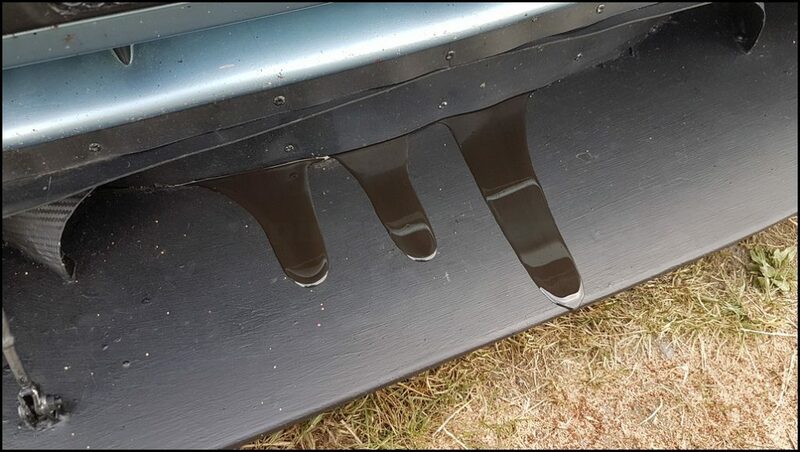 It had run onto the splitter and only started dripping off once we stopped. Matt was absolutely devastated and wouldn’t talk to me. He just walked off. I felt sorrier for him than about the car breaking down. I’d pestered him into driving and through no fault of his own something had broken. Having being sat next to him for the lap I knew he hadn’t over revved it, missed a gear or done anything that could cause the failure. He stopped as soon as he realised it was terminal but none of that mattered to him. Whilst waiting for the recovery truck I explained that it was probably something I caused when I was out with Misha. ‘Well why was it fine for the rest of the lap and half of this one then ?‘ I had no answer. I told the Marshall we would wait until the end of the day, it was 4pm and the chequered flag was due out at 4:15. I didn’t want to cause anyone to have to slow for the recovery truck on their last lap of the day and he was happy to sit and talk to us watching the cars go by. 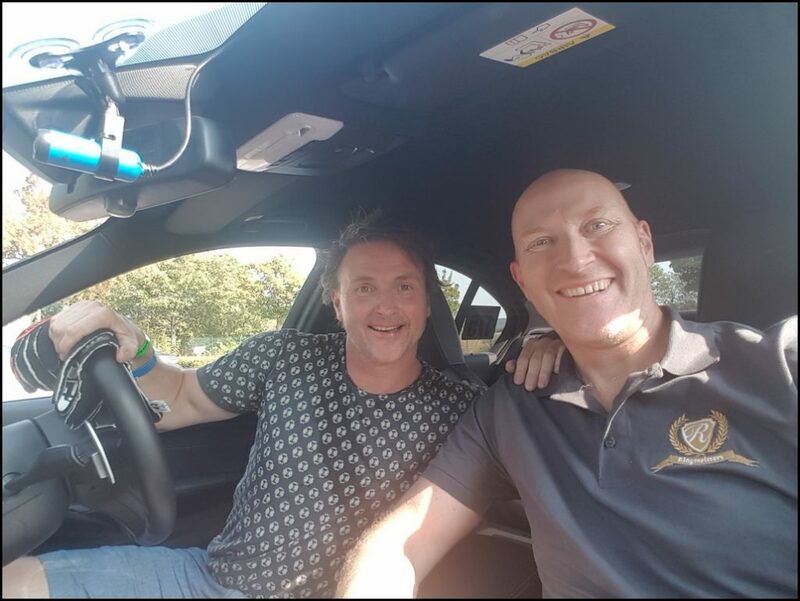 If you have ever read any of my previous trip reports you will know Sam Tate and I have a bit of a laugh winding each other up. I wind him up about why he is slower in his Schirmer E46 which cost a very significant amount of money than my garage built MK2 Golf. In response he winds me up about my Golf breaking down. 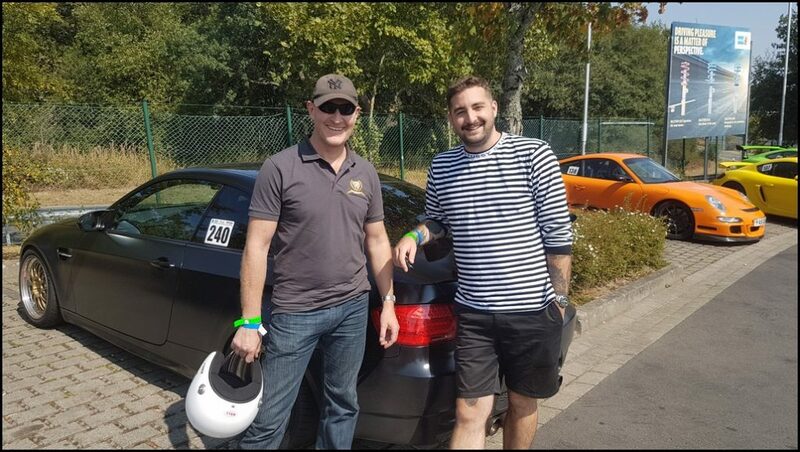 It is good natured banter and we are pretty even, he’s never driven his incredible M3 faster than I drive my rattly old Golf and so far he hasn’t had a failure that has caused him to be recovered on the Nürburgring where I have had a few. What makes it even worse is that my so called ‘friends‘ had a Whatsapp group where they were having a sweepstake on what time I’d break down. That was when not if… Sam only went and bloody won it. We were dropped off in the overflow carpark and as soon as the car was unloaded and the car was pointing downhill, oil started leaking from under the airdam. I lost count of the number of people who asked if I had a spare gearbox. The answer was “YES, but I left it at home…”, Why ? It was the first time driving with the 6-speed and you didn’t even bring a spare? I was thinking the same myself but I’ve built several gearboxes and never had an issue so didn’t forsee any problems hence leaving the spare at home. As you will see later, that wouldn’t have made the slightest bit of difference as the damage was far more than a simple gearbox failure…. After a shower and a change we went to La Lanterna for a meal. Whilst I wasn’t sat in a corner feeling sorry for myself, I wasn’t the happiest I’ve ever been either. We had just finished day 1 of a 2 day Prime trackday without a single stoppage and track conditions were almost perfect. Tomorrow looked to be even nicer and my car was on the trailer and wasn’t going anywhere. 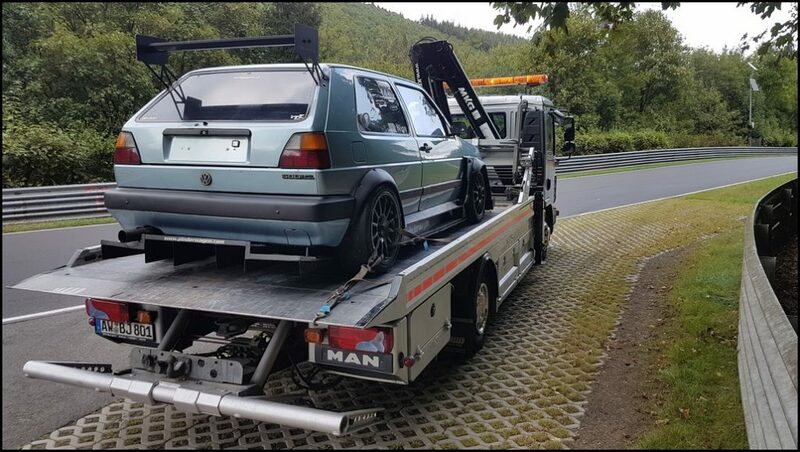 I was at the Ring on day 2 of a 2-day trackday and the Golf was out of action. I could have hired a car but I just wasn’t in the mood to be honest. I decided to get in a load of passenger laps instead. My daughter suggested I take the X5 out for a few laps on day 2 as something was better than nothing. I have to say, it was an great idea. 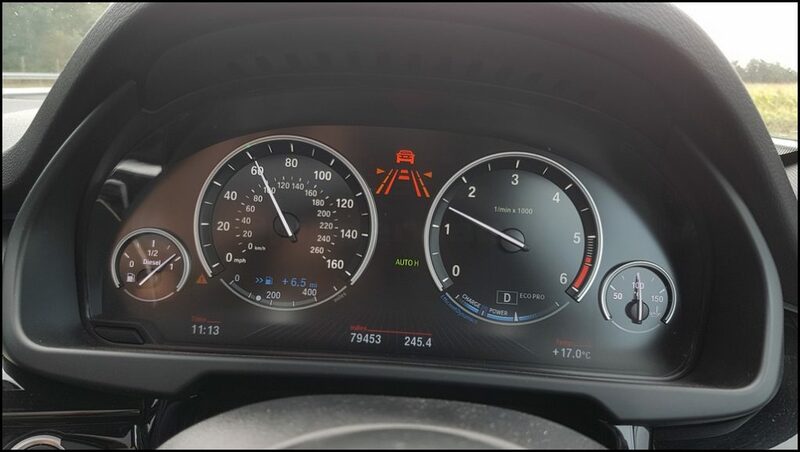 It’s a F15 40d Diesel X5 and I knew, it wouldn’t exactly be slow. Lou came out with me on the first lap, I put it into Sport mode but left the gearbox in Auto, turned on the aircon and went out for a lap. What a very different experience! The acceleration out of the corners was just silly, it just gripped and shot forwards. The brakes on it are bloody epic, when I bought it Matt and I went for a drive and on a clear stretch of road I stood on them hard. We both looked at each other wide eyed and commented they stopped better than my Golf or his E46. 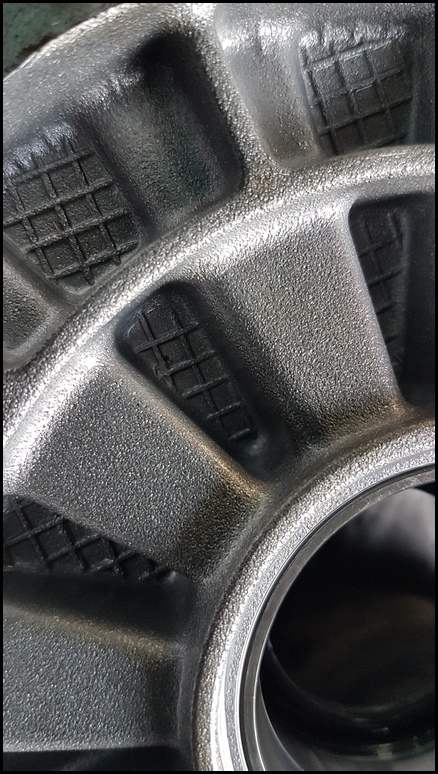 In fact, they stopped better than any other car I own although after repeated stops the pads start getting too hot but they are only standard road pads so it isn’t surprising. I had no intention of driving it so hard that I risked the car in anyway whatsoever. This had to get us back home and my driving reflected that. I was smooth, used the brakes sparingly and concentrated on being as smooth as possible. The 2,200kg weight of the car certainly made itself felt, going round miss-hit-miss felt like it was trying to pull itself sideways rather than go round the corner. On the long straights I feathered and left it cruising rather than keeping it nailed all the time and by the time we came back into the carpark Lou said it was one of the most relaxing laps she’d had in ages. Not quite sure what that says about my usual driving..
A short while later I took Matt out for a lap, same driving style and my eyes on the mirrors all the time. If I saw anyone approaching I moved out of the way early enough so as not to affect their lap at all. We were both impressed with how the car felt and dealt with the bumps and kerbs but there is no getting away from how heavy it is. It made the Golf seem featherwight in comparison. What it did convince me of was something I’ve been thinking for a while now, my next car will have air-conditioning. The Golf gets very warm and on a scorching day like this the aircon made a huge difference to driver and passenger comfort. 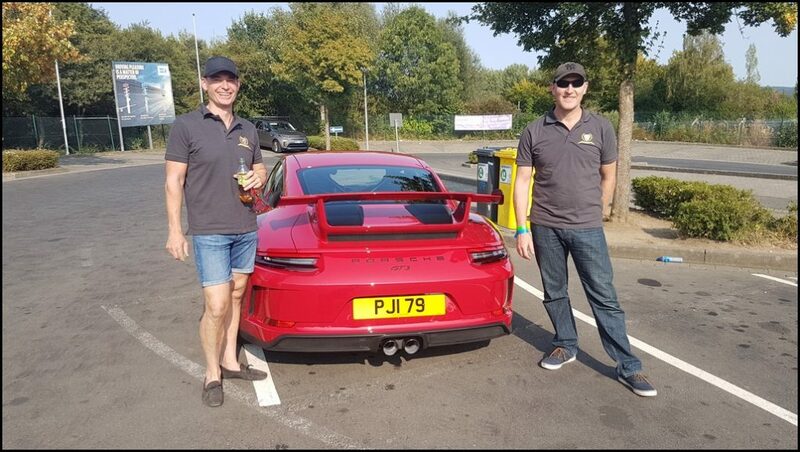 I met Nige the other year on a DN event when he was over with his family and his 911. 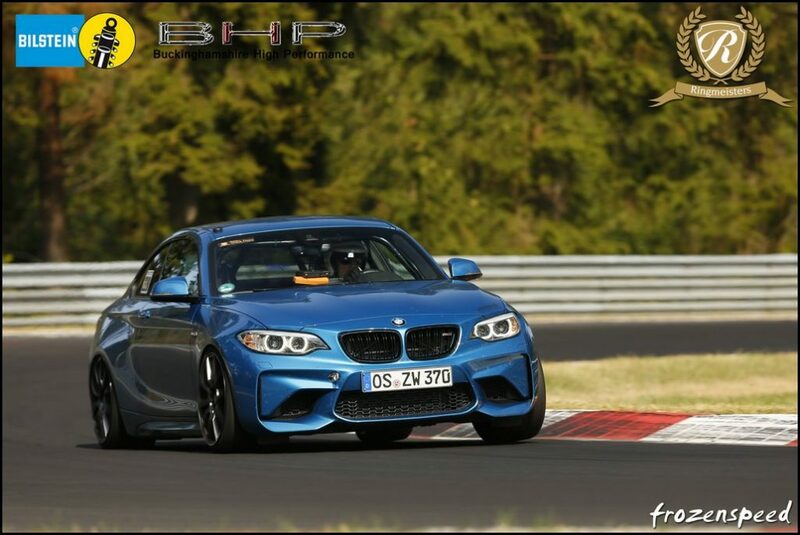 He’s bought one of the BMW built M235i Racecars. They come ready to race, caged and everything and he had picked up a very tidy example and this was his first time out in it. I went out for a lap with him. What a fantastic car ! The grip was mind bending. Seriously, I couldn’t get my head round just how much grip and traction he had. I’ve talked about the improvement in suspension over the last few years and this brought it all home to me. 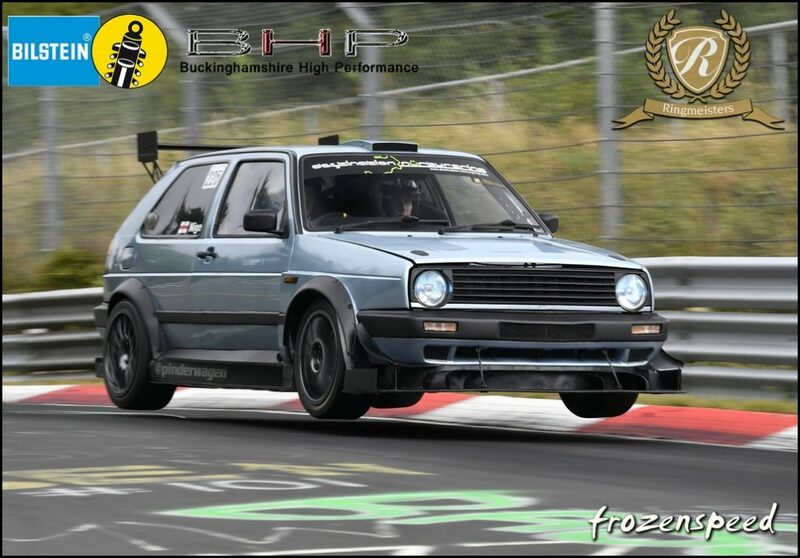 A modern car, setup for the track and driven well offered a level of grip in the slow and mid speed corners above anything I can achieve with the Golf. But oh my god, it was so HOT in the cabin. I thought the Golf was bad but without a roof vent feeding cool air to the driver and passenger, this felt even hotter and I wouldn’t have wanted to be a passenger for more than one lap. Nigel‘s driving was nice and smooth and I felt completely safe but it was just too warm. I’ve been looking at one of these for my next car but that lap confirmed a niggling feeling I’d had about them. They feel like that have more grip than power and whilst fast and good fun, I want something that is just a bit more of a handful. That seems like I’m being negative about the M235i but I’m not, it really is a brilliant car and I can understand why Nige bought it. Perhaps after he’s driven it a few more times and is pushing on harder I’d feel differently but at the pace he was driving it almost felt easy. That is partly down to him being a smooth driver and letting the car flow but I just couldn’t get away from thinking is needed more power.. In 5 years when I retire I’ll be starting my next project and I am regularly asked what that will be. It changes between and E46 with an LS V8 to various other choices but I keep coming back to the same thoughts. The E46 is getting on a bit and they certainly will be in another 5 years. What comes to the top of my list every single time I discuss it is the Cayman or an M2 and no matter how many times I look at them both, the M2 keeps edging it. It’s lots of little things and if you ask me in 3 years I may have changed my mind again but isn’t that part of the fun ? Playing the ‘what’s next’ game where you ask yourself what you will get next and why ? He had already done 3 back to back laps, driven into the car park and I’d jumped in and by the end of the 4th lap the tyres were certainly struggling. It had aircon, was a cool and comfortable place to sit and the suspension did a fantastic job over the bumps and crests. Yup, if I had to decide tomorrow, this will be my next car before starting on the improved suspension, brakes, cage and making it a ‘club sport’ spec. Still keeping some creature comforts but creating a more track focussed version and lightening it as much as practical. The circuit is open from 08:00 until 16:15 with no break for lunch but most drivers naturally take a break around 12:00 and have something to eat in the Devils Diner. It was the only time I saw the carpark this anything close to being full during the 2 days as the rest of the time everyone was out lapping. Russ, Jamie, Sam and Paul were having some epic convoy laps and I was watching them flying down Dottinger Hohe nose to tail. Damn, I wanted to be out in the middle of that. Paul had driven across in his GT3 and took me out for a lap. I’m not a huge Porsche fan, they have never been an aspirational car for me but there is no getting away from just how good they are. Paul is a very handy driver himself and even though he wasn’t driving anywhere near flat out we were flying and that engine noise is bloody amazing. When returning to the carpark we commented on just how empty the carpark is. This was mid afternoon and everyone else was out on track. You never see that in TF. I wasn’t the only one to have car issues and Anthony had taken across his incredible GTR. Sadly wheel issues on Day 1 meant he couldn’t drive it on the second day and it was put on the trailer to take back to the UK. Like me he was driving his daily for a few laps, the difference being his daily is a V8 M3. He took me out and similar to the M2, you could feel the weight of the car working against you but he wasn’t hanging about during the lap. 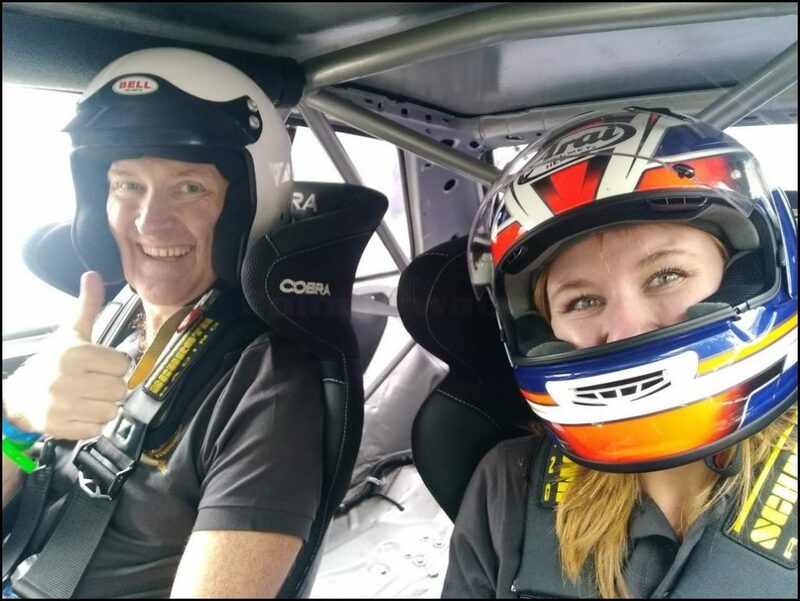 It was very enjoyable and whilst both of us had issues which meant we couldn’t drive our track cars, our smiles at the end of the lap weren’t forced. You just have to make the best of it don’t you ? 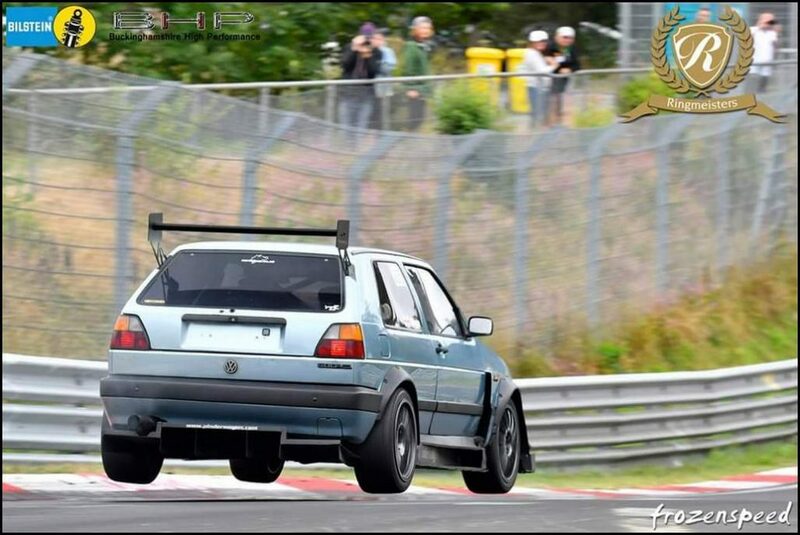 On an event like this with the Nürburgring open and almost empty you couldn’t stay depressed for long. After he’d cooled down a bit we started the lap after I had explained it was going to be slow and steady. There is supposedly an Apex, but bah who cares about that when you are enjoying yourself so much. What made us chuckle more was when we passed some other cars on the lap even though we lifted and coasted up Kesselchen and didn’t exactly attack any corners. It just showed how much circuit knowledge makes a difference, it was obvious the cars we were passing were unsure of the correct line, they were experienced enough to know what was next but hadn’t started honing their lines and speeds. 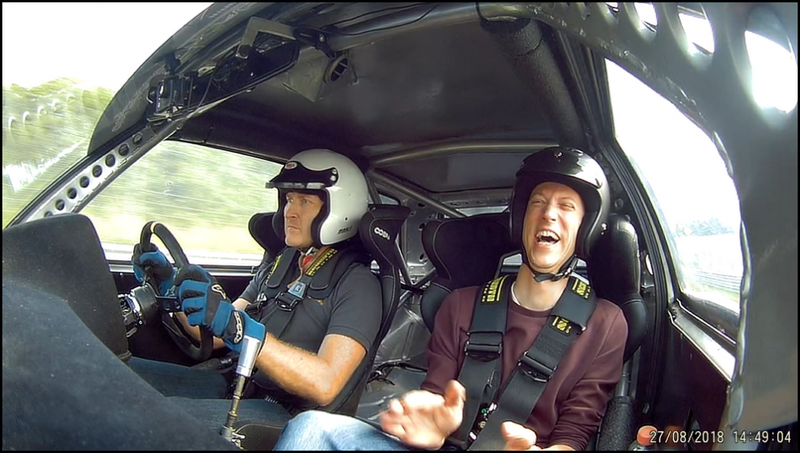 What they thought about being passed by an X5 on the lap is something I never asked…. Ryan was out again in his M3 and I’d planned to take him out in the Golf. As that didn’t happen he took me out for a lap and I gave him some simple pointers. I’m getting better at helping people where there are big gains to be made but it’s the smaller incremental stuff I still struggle with and it makes me appreciate how hard it is to be a good instructor. It was almost the end of the day and I was walking back towards the office when I saw Andy going out in the Schirmernator II. I quickly got into the passenger seat and buckled up as we drove out of the carpark. We spent the lap talking about lines, how the car felt and responded to certain bumps or camber changes. Where were places to focus on improving and risk vs rewards in others. A technical 8 minutes that gave me a lot to digest afterwards. The red flag came out and it was day over. Someone pointed out that there hadn’t been a single red flag over the 2 days. We’ve had the odd day where we never saw one, but 2 back to back days is unheard of. Even the regulars who do days with some of the other high end organisers said they had never had 2 days with zero stoppages. I can’t imagine a better way of summing up just how special these 2 days were. The weather was a bit on the hot side but it feels petty to even mention that. Compared to a wet and rainy day I will take sweating a little bit every single time. 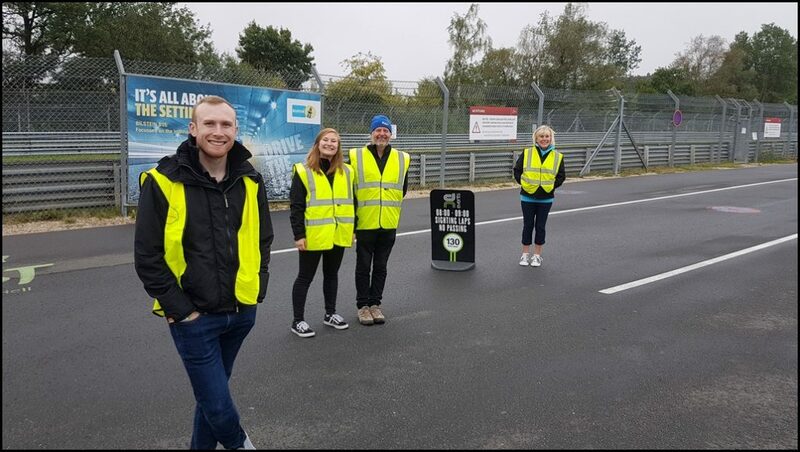 You could have as many clear laps as you or the car could take and loads of people were congratulating Darren on the best 2-day event at the Ring they’d attended. What they did do was wear them and collect transponders from drivers leaving the carpark. It never ceases to amaze me how many people forget to hand them in at the end of the day. 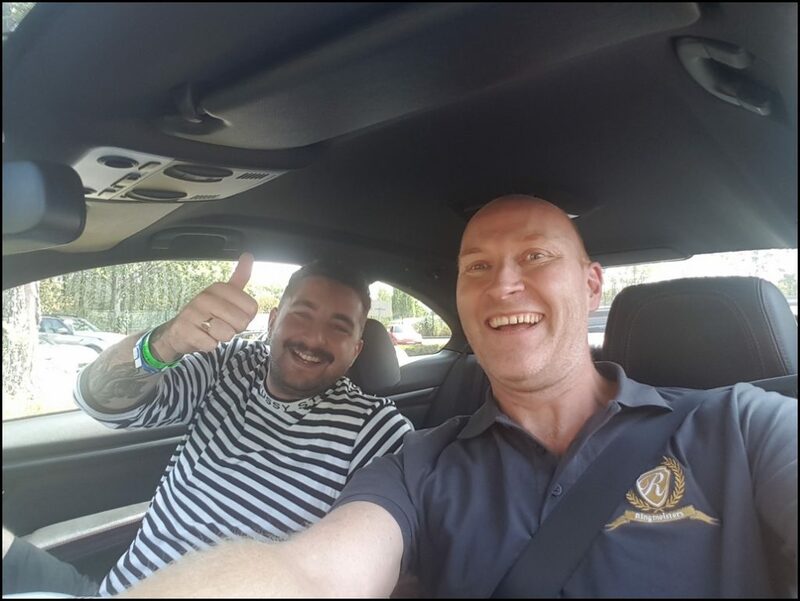 Once we had loaded everything up and whilst Lou was having a shower, Martijn took me out for a TF lap in his Clio. It was so busy and after 2 days of clear lapping I said that to Martijn, he replied that it if I thought that was busy, I wouldn’t believe how busy the weekends were there now. I appreciate the Ring is a lot busier than it was when I started coming here back in 2005 but it seems a lot busier than I remembered. 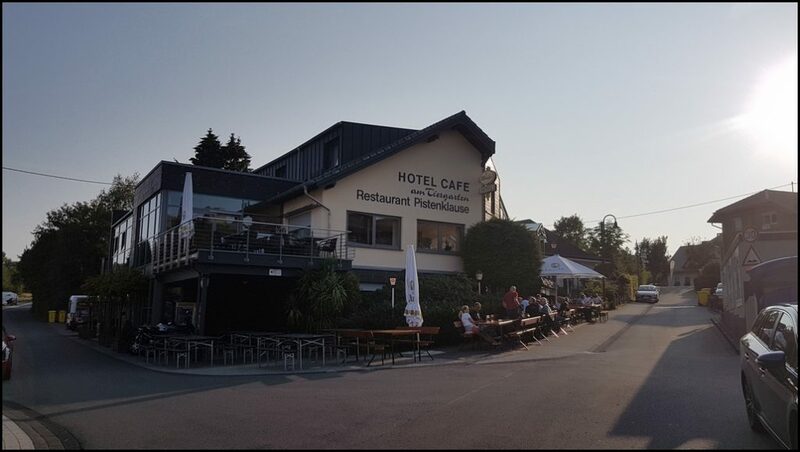 A 15 minute walk up to the Pistenklause for a meal to discuss the last few days and to unwind. As always Darren asked for areas we could improve future events. 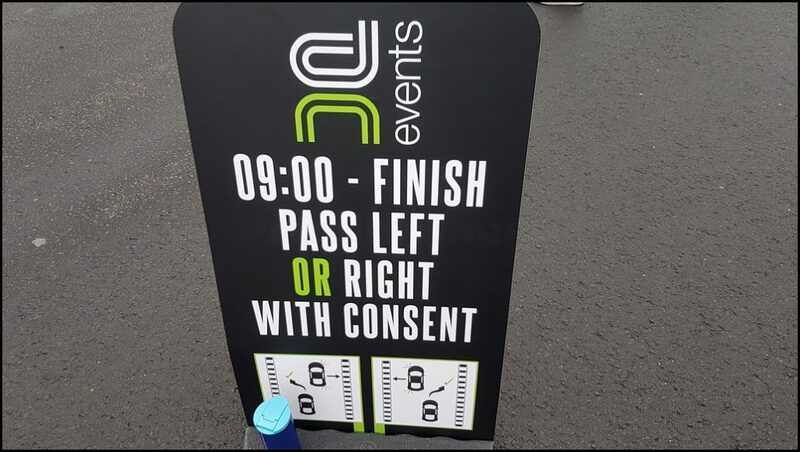 When the only thing anyone can think of is “perhaps some pre-printed signs to remind people to return their transponders”, you know the event was pretty much perfect. Darren says such a thing doesn’t exist and always wants to improve but I’ll be honest and say I am really struggling to see how the organisation and running of the day could be better. I guess by the time next year comes around we will have found something else to suggest, we always do. 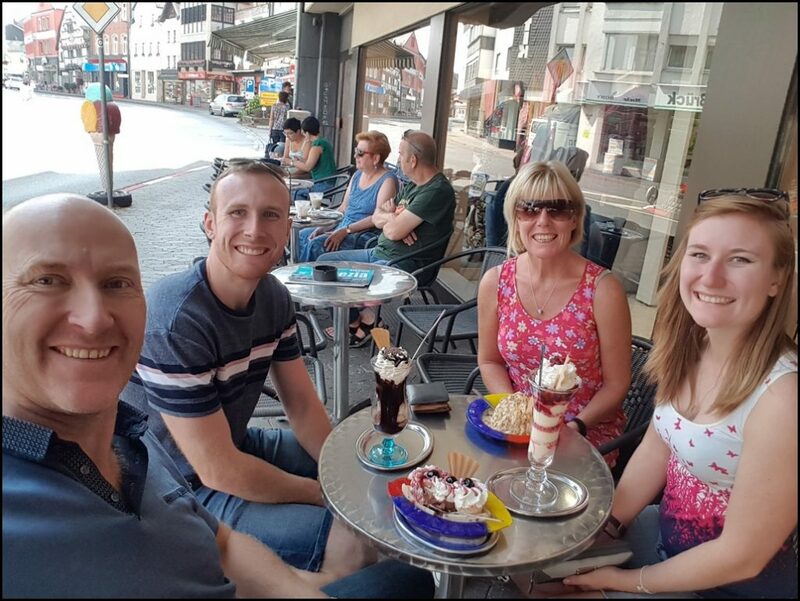 Before setting off back to the ferry we had, what is becoming obligatory, an ice-cream in Adenau before some last minute shopping. Once we arrived home I unloaded the X5 and Lou said she was going out to see friends so I could work on the Golf if I wanted and see what had failed… I didn’t need telling twice so Matt helped me lift the engine out. It takes another 30 minutes compared to just removing the gearbox but it makes any other work much easier with an empty engine bay. Once it was out I had the usual look around and spotted a problem with the steering rack. 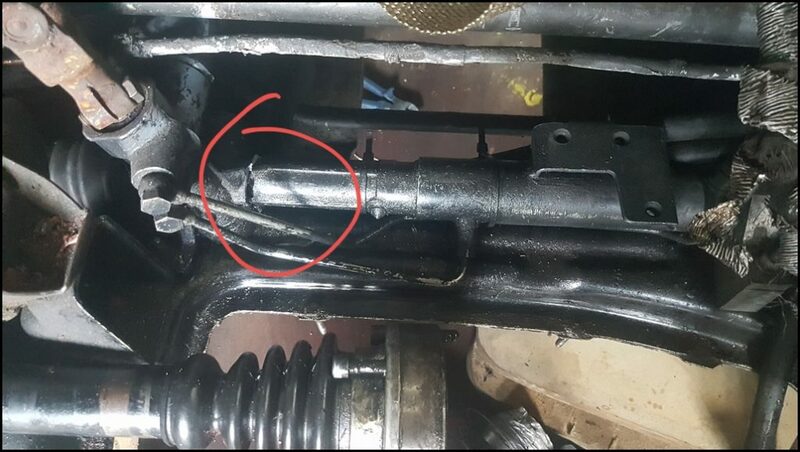 It doesn’t take a genius to realise the steering rack shouldn’t look like this !!! The outer housing had snapped clean in two I have never seen this before but it explains why I was feeling a clunk through the steering wheel and needing more lock. 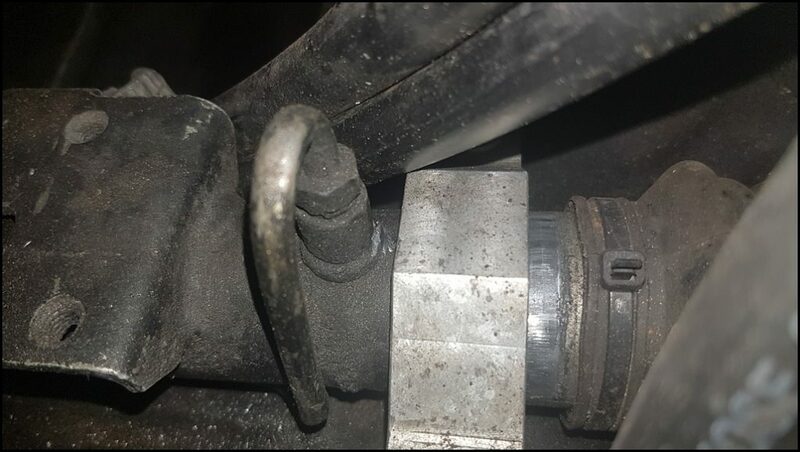 The actual pinion was staying fixed but as the nearside end was floating, the high pressure hoses to the piston were moving, this in turn changed the steering effort in certain positions. On left handers the rack was pushed to the drivers side and acted as normal, but on right handers it allowed it to open up. 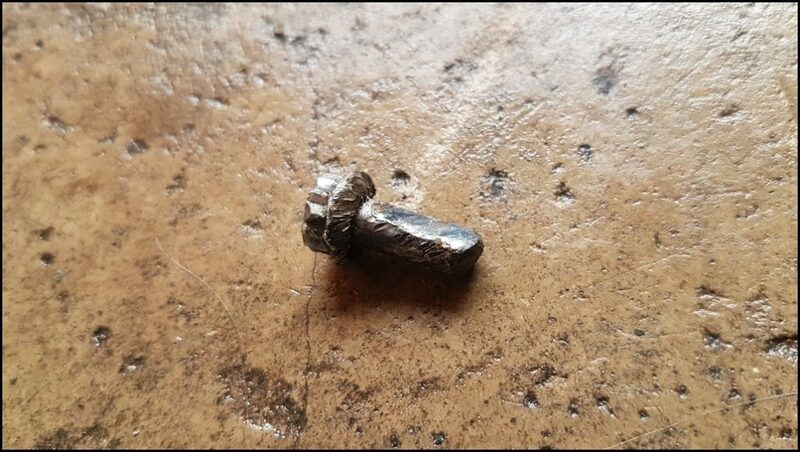 This was hidden behind a heatshield and simply couldn’t be seen until it was removed. I fitted the spare but made a plate that bolts to the 3 M8 captive nuts to the right of the rack where the old rod-change mechanism bolts to. 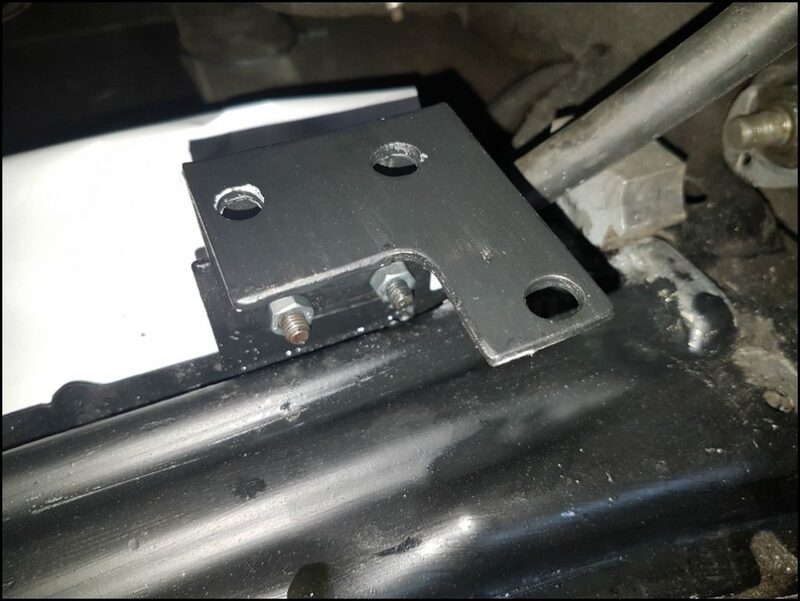 The plate is welded to the subframe so locks that half of the rack ensure it is held solidly in place at either end which should stop this ever happening again. Now onto the reason I removed the engine and gearbox in the first place. 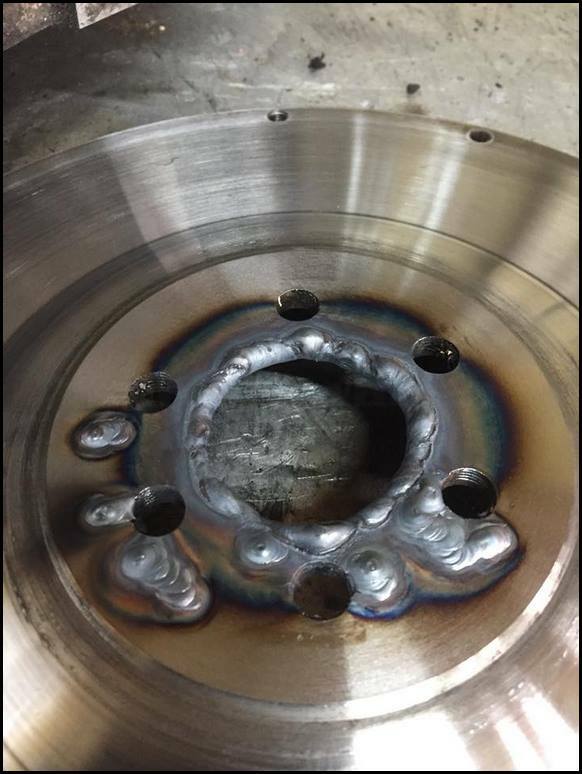 The failure from my over-rev. 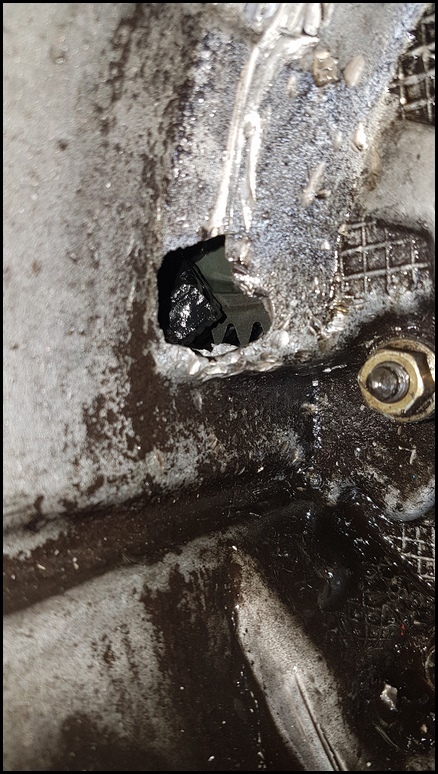 Looking into the gearbox bellhousing and we saw a hole. Never a good sign. After stripping the gearbox, the internals were immaculate, just as clean as when I built it a few weeks before. 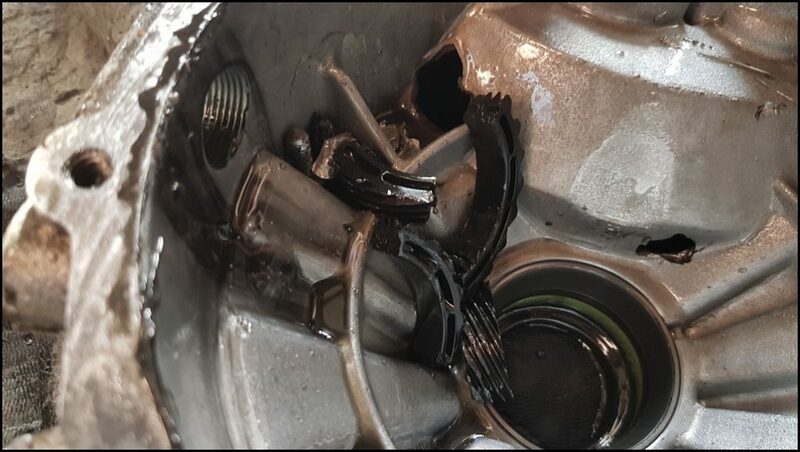 The input and output gear shafts were completely undamaged and by this point we weren’t sure what could have caused the problem..
We then removed the diff and then I found 3 small bolts wedged behind the ring-gear and a smashed plastic speedo drive ring. They looked familiar and I realised they were the clutch pressure plate retaining bolts but they had been bashed around quite a lot. 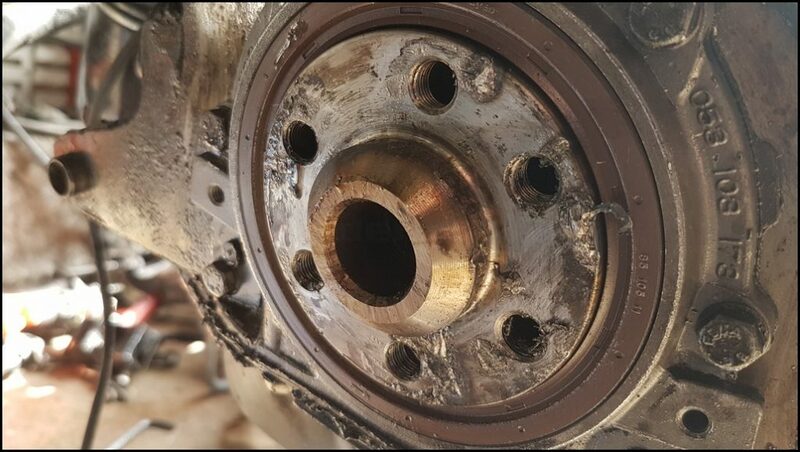 They had sheared off in the flywheel and entered the gearbox. 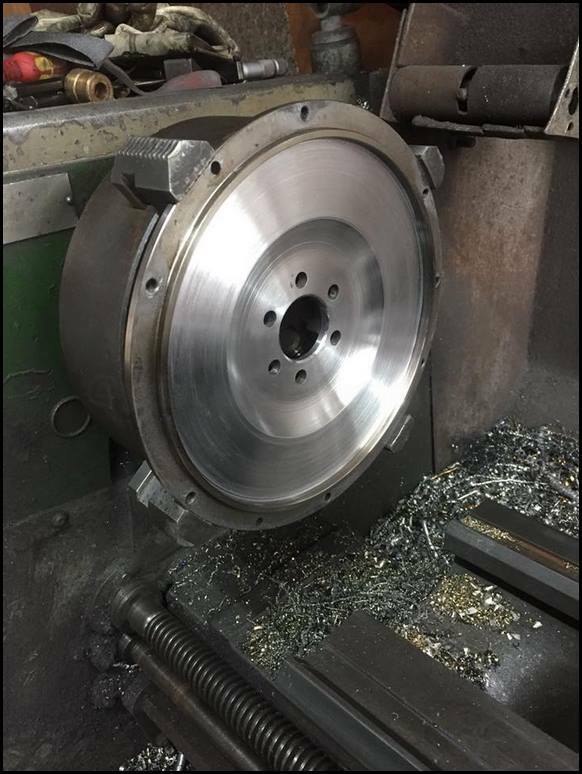 I grabbed the flywheel and felt movement. Trying to rotate it by hand and it rocked back and forth. Oh, that is never something you want to feel. Putting a socked on the bolts to remove it and all 6 weren’t even tight and simply would out by hand. 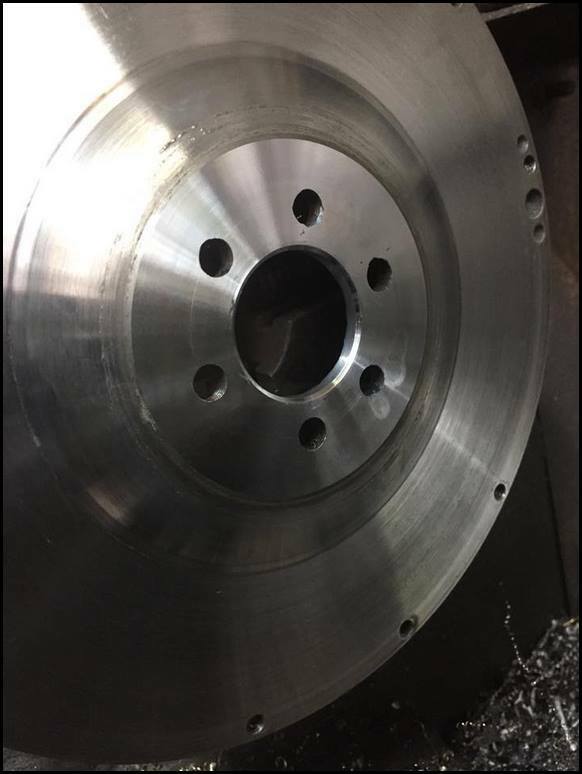 After removing the damage to the end of the crankshaft was extensive with a lot of surface fretting between the flywheel and crankshaft. The rear of the flywheel was also badly damaged. The damage found I believe happened due to my overrev, it was not simply overrev of keeping the throttle pinned in neutral which the ECU rev limit would have stopped but what I did do was go into 3rd and dump the clutch, instead of 4th, this caused a massive shock from the wheels turning much faster than they usually would in 3rd gear sped up the gearbox internals, in turn this sent a massive reverse load into the flywheel. 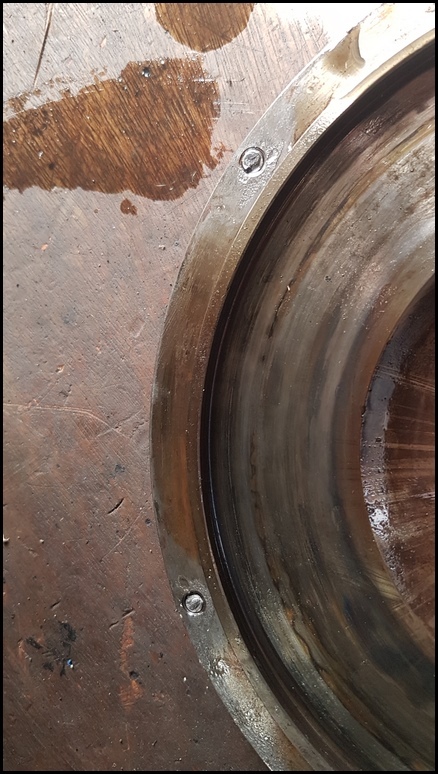 Despite the flywheel bolts being new and tightened to VW specifications, when I fitted the gearbox, the overrev was obviously too much and the flywheel slipped 10 degrees or so in the holes in the opposite direction to usual. Once they had moved once there was opportunity for it to move back in the other direction under acceleration and vibrate the bolts loose. Over the next lap every gearchange put load onto the flywheel and the bolts became looser and looser resulting in vibration which caused the clutch and pressure plate to oscillate, the 3 bolts sheared off but had nowhere to go, so bounced around in the bellhousing like a ball on a roulette table, eventually smashing a hole into the gearbox and causing the loss of oil onto the splitter. In order to get it fixed everything went to, Martin who runs Gas’n’Gears and is the go-to guy for VW gearbox repairs and rebuilds. 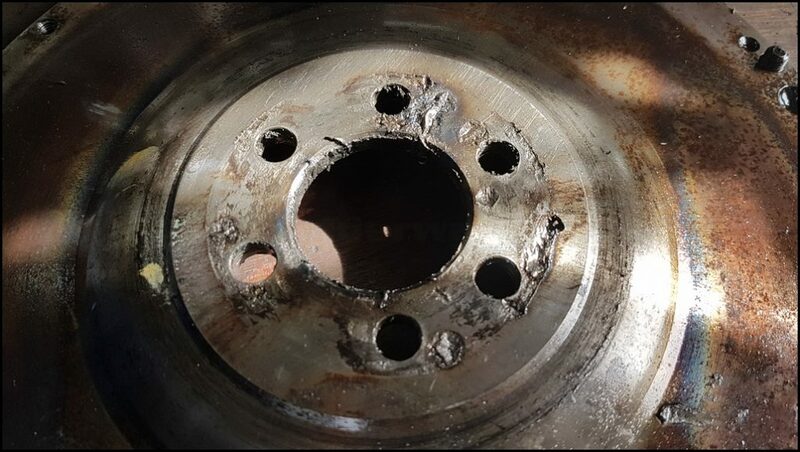 He’s built and repaired numerous gearboxes, over time he knows all the little tricks and settings to optimise them for track use, even he hadn’t seen this failure before. 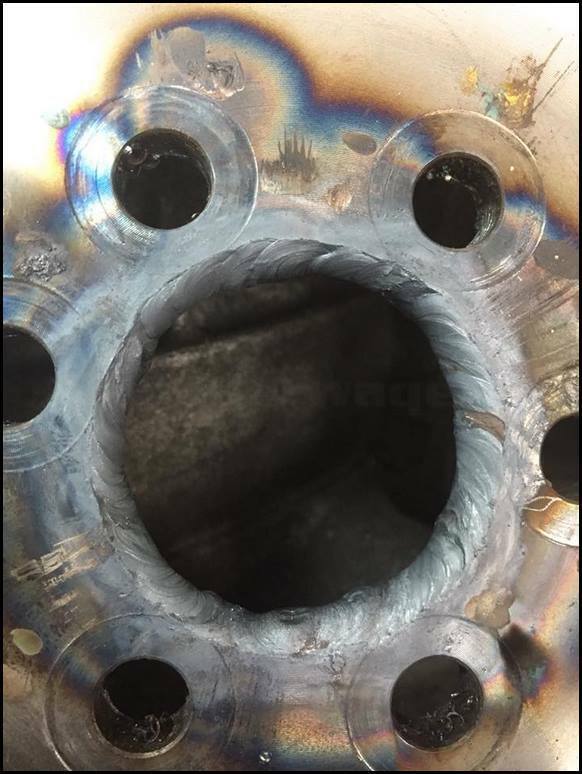 After shipping everything across he tackled the flywheel first, a die grinder to clean the grooves then a TIG welder soon filled in the marks in the flywheel. Bolting it into the lathe and he was able to skim it back to true. He supplied a replacement bellhousing and spare crankshaft he had. 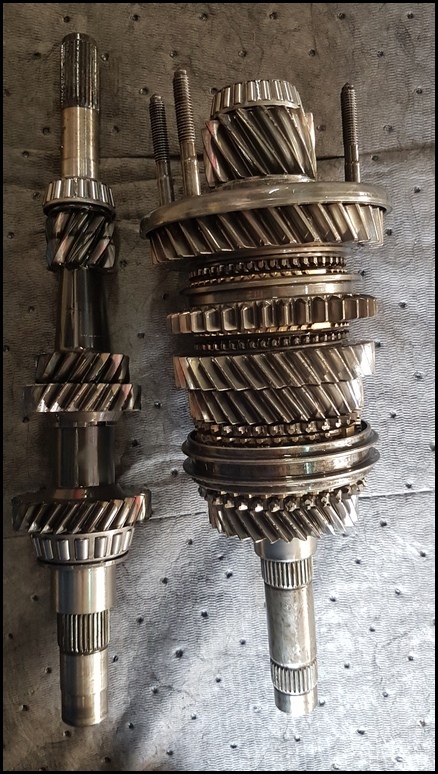 Martin rebuilt the gearbox with no issues at all, all that was required was a replacement plastic speedo drive for the diff, the rest of the internals were undamaged. Everything was returned within 3 days and I fitted the crank, bolted everything back together, and refitted it all into the engine bay. I made sure the selector mechanism was set up absolutely perfectly before taking the car for a shakedown at Blyton Park where I lapped all day with no issues at all before the next trip to DN20 at the end of September. I’m delighted to report I suffered no gearbox / engine issues but that’s for the next report.